Lost in the hoopla of putting together arguably the best 8/9 combo of J.J. Putz and K-Rod was the fact that fan favorite Endy Chavez was shipped out of New York. Endy is part of the rare breed of professional athletes these days that don't "play for the cameras". He doesn't argue about playing time, doesn't complain about the money he's making, and doesn't showboat after a crucial play. He simply does his job - shows up every day ready to play, and plays his heart out when called upon. He also was part of one of my greatest memories of the Mets and Shea Stadium. Everyone always remembers where they were when a key moment involving their beloved sports team goes down. I know exactly where I was, who I was with, and how I celebrated when Robin Ventura hit his Grand Single, when Todd Pratt hit the homerun against the Diamondbacks to end the series, and when Endy made "The Catch." I'm sure there are a million stories from everyone that witnessed this feat. I will implore you to leave your story about Endy's catch in the comments section, however the following is my tale of how I almost missed it. In order to ease the pressure of a Game 7 for the right to go to the World Series, my friend and I had a couple of Shea's famous aluminum can 16 oz. Bud Lights. In the top of the 6th we debated when the most opportune time would be to go to the bathroom. I decided that after Jim Edmonds' at-bat, I was going to go. Edmonds walked, and my friend and I sprinted down the tunnel to make sure we missed as little of the game as possible. To our horror, the line for the bathroom stretched about 2 sections down from where we were sitting (apparently we weren't the only ones to dabble in the aluminum Buds). To wait on a line like that meant that you were going to miss at least an inning of play...maybe more. So we said screw it and jogged back up the tunnel to go back to our seats. Emergency starter Oliver Perez was getting set to throw the next pitch to Scott Rolen, so we crouched down just inside the tunnel to watch the pitch before we headed to our seats. Now is probably a good time to mention that our seats were in the Loge (Blue) section on the leftfield side. What happened next is something that will be etched in my mind forever. Scott Rolen connected and my first thought was "Oh No" - (Actually it was a lot more colorful than that, but thats essentially the PG Rating). As the ball headed down the line I remember turning to the left to see how far the wall was from where I thought the ball would land. When I did this, though, I caught a glimpse of Endy going full speed toward the wall. Even though the play happened so quickly, I remember thinking that Endy actually had a beat on the ball. And then BAM....when I woke up from this fantasy sequence, Endy Chavez had just made the greatest catch I'll probably ever see in my lifetime in one of the most crucial situations - and managed to double up Edmonds on first. A normal reaction would have been to turn to my friend and celebrate with him. But there was no sense of normalcy in what just happened and I let my instincts take over. I ran in the aisle towards the section to my left and jumped into a random stranger's arms. After this embrace, I proceded to run about 10 sections down, high-fiving everyone in the 1st row along the way. Realizing I needed to get back to my seat, I turned around and double-backed the 10 sections (still high-fiving everyone) and found my friend. Apparently he had just gone through the same routine for the 10 sections to the right. I remember almost collapsing due to the sheer exhaustion of what I had just gone through. And when the dust settled I realized how close I came to missing this moment. I don't think I ever could've forgiven myself for missing this catch because I had to wait on the bathroom line. (By the way, if you're reading this and you were on the bathroom line that night....uhhh, tough break). As we all know, the Mets went on to lose Game 7 in devastating fashion. But those 4 minutes at Shea will live on in my memory forever. I will never forget how loud the stadium roared, and how much joy I experienced over one play. 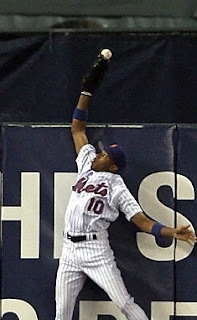 So thank you Endy Chavez for this memory. At least to this Mets fan, you will never be forgotten.